This tag was made using the "Life's Journey" assorted tags from K&Company, green ribbon from my stash, a recollections flower from Micheal's, a metal tag from my stash, Making Memories epoxy buttons, the butterfly and mini green flowers were extras that were sent along with an order placed at an etsay store, (sorry I do not remember the name) and the silver ribbon was purchased from Hobby Lobby. This card was made following a card made by one of my favorite card makers "GinaK" from Gina K Designs/Stamp TV. I used teal card stock to make my card base (cut 4.25x5.5) black card stock (cut at 5.25x4) for my first mat then white card stock (cut at 5x33/4). I then used my CTMH Pacifica ink pad to stamp the larger flowers using the Posy Patch Flowers stamp set by Heartfelt Creations. The starburst from the close to my heart heart "My Acrylix" Birthday stamp set that comes with the Cricut Art Philosophy cartridge that can only be purchased at CTMH. 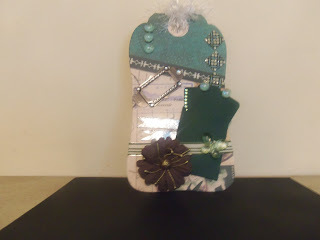 The leaves were made from the CTMH "Natures Delight Petite Perks stamps. I also used ribbon purchased at Hobby Lobby and cut the sentiment using my Spellbinders "Classic Ovals Large" dies. To stamp the sentiment I used The Paper Studios Clear Word Stamp set from Micheal's. I know I have been gone for a while but I have had some other things going on that were taking up my time. At first I had trouble posting pics to my blog then I hand made 100 wedding invitations and RSVPs took up so much of my time that I will not do it again. I don't have any pics I was just so glad to be done that I mailed them off without taking pictures. But I am back now doing what I love!!!! Making cards. This first card was made using a pre-made card of craft paper. I used one of the stamps from the close to my heart Honeycomb Flair stamp set, along with the close to my heart Goldrush ink pad, and stamped it all over my card base. 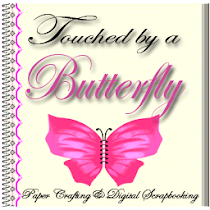 I then used a chipboard butterfly (can't remember where they were purchased) some yarn from my stash, the sticker sentiment from The Paper Studio Autumn Splendor sticker pad from Michael's and the flower petals were made using the petals die that I purchased from life styles crafts at last years CK Srapbooking Convention, and I can't wait for the one coming in August, I will be there!. 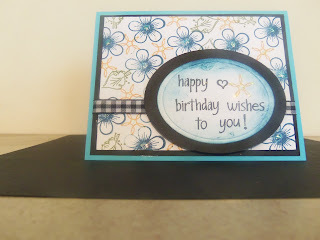 I embossed the petals using the swiss dots cuttlebug folder.